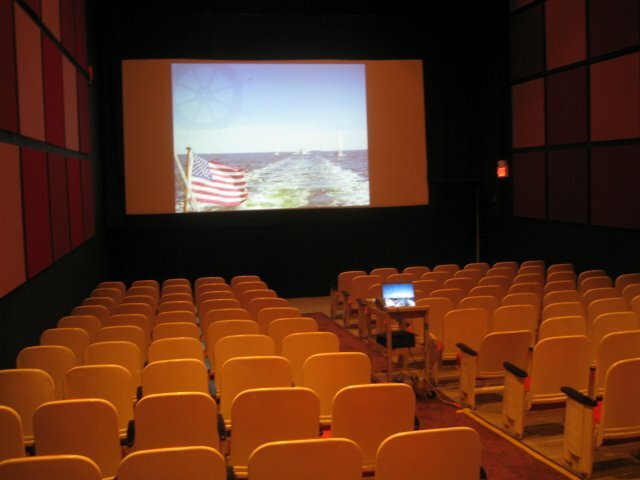 The seminars were held in an old movie theater that is still in use. There are at least 3 screens. The acoustics in our theater were very good and people had no trouble hearing without a microphone. About 50 people attended my talk which was very good considering the rather low turnout overall. My slides looked great on the huge movie screen. (see photo). Mavis sold CDs at a table in the back of the theater. My talk was at 8:30 so we were free to see the town by 10:30AM. We had lunch in a 1949 soda shop restaurant. There was a really great chandlery on the docks and for the first time ever I found a Greek seaman's hat that fits. They even had one that was too big for my head. Now I can look really cool at the helm of our boat or in Mavis' Miata. Tomorrow we are on the 8:00AM ferry to New London and continuing our trip to Newfoundland.